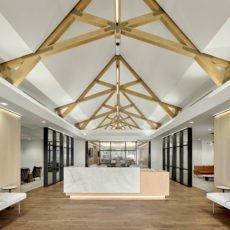 This Venture Capital firm sought to create an inspiring open space, while also preserving privacy for their clients and team. 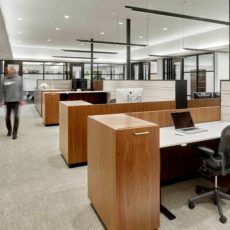 The Pivot team worked with local vendor Creative Wood to design and fabricate custom workstations in stunning walnut wood and warm laminates, with blackened steel supports to complement the architectural finishes. Aeron chairs and all height-adjustable desks facilitate healthy sitting and standing postures. Storage and power are easily accessible in millwork side walls, and custom Filzfelt acoustical materials provide tactile softness and quiet calm. Custom ebonized salvaged wood conference tables from Urban Hardwood are fitted with integrated power for a seamless experience for employees and visitors alike.